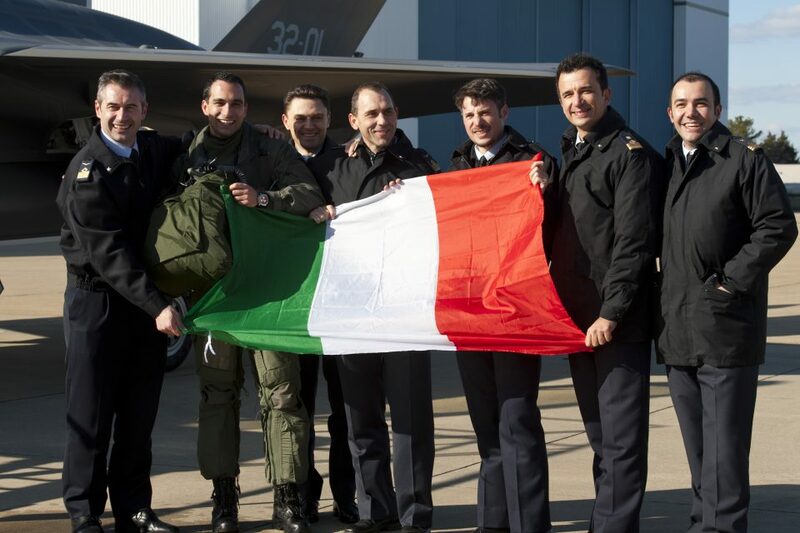 2016-02-08 On Feb. 5, the Italian Air Force’s first F-35, AL-1 with code “32-01” and markings of the 32 Stormo Wing landed at Naval Air Station Patuxent River, Maryland, at the end of the JSF’s first ever transatlantic flight. 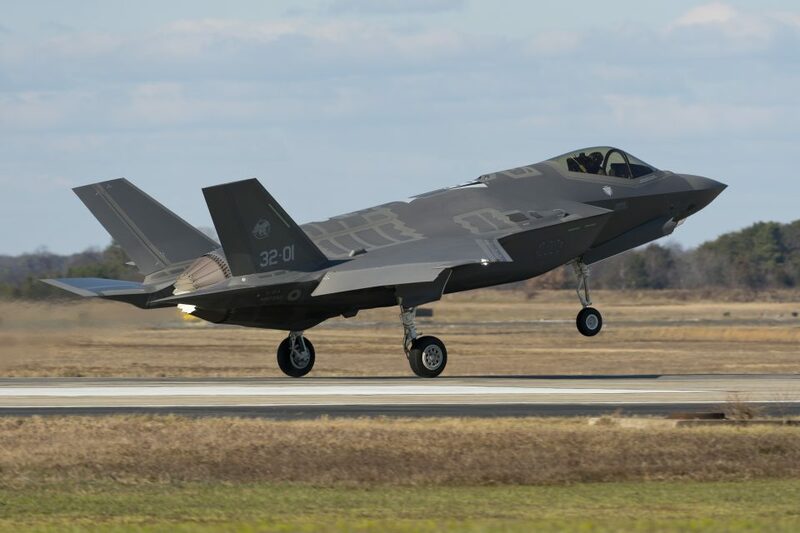 The aircraft was piloted by “Ninja,”an Italian Air Force test pilot, belonging to the Reparto Sperimentale Volo (Test Wing) from Pratica di Mare, and who had successfully completed his initial F-35 flight training at Luke AFB in November 2015. To put this in perspective, the pilot had only 50 flight hours of F-35 flying experience. And the Lightning II which Ninja flew across the North Atlantic in winter had only 15 flight hours on before he took off on his historic flight. 32-01was the first plane to came off of the Italian assembly line at Cameri Italy. And this was done in the middle of winter, flying in and out of cloud layers over the turbulent North Atlantic against 120-knot headwinds. It was remarkable flying. After his 7-hour flight he sat down with reporters to discuss the flight and what he sees as the way ahead for the F-35 program. For the first day, we went from Cameri to Lajes AFB in the Azores via Palma de Mallorca. This was the first time the F-35 had landed in Portugal. We had to wait out the weather for a day and then flew the 2000 plus miles past St Johns to Halifax to the Boston area and then we arrived in Maryland. 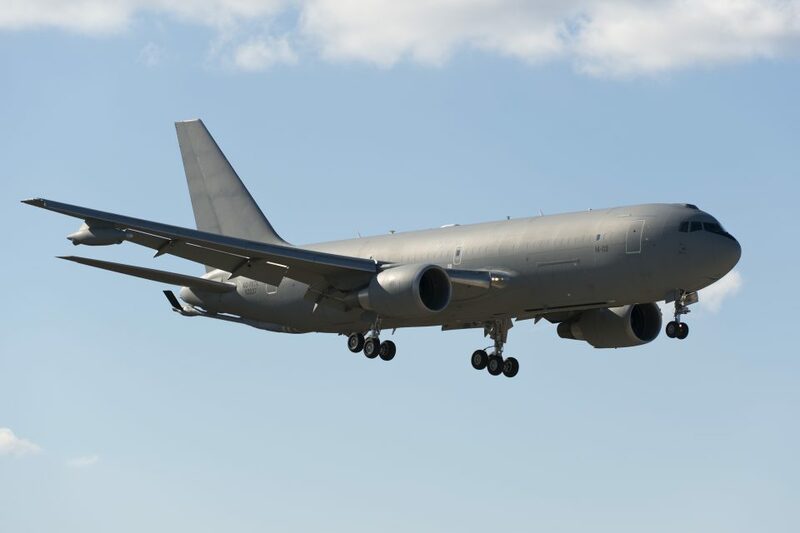 For safety and security reasons, we had four air refueling during this second leg, and given how bad the weather was the fourth refueling was done close to Pax River again for safety and security reasons. The flight lasted 7 hours. Question: You flew in formation and through heavy clouds, we understand? Answer: We had four aircraft total; and kept tight formation; and refueled in the clouds as well. We had two C-130s just in the case; the tanker, a Typhoon headed to Red Flag and the F-35. Question: So you were in a new aircraft, single engine, flying in the middle of winter across the North Atlantic in heavy headwinds? Question: Did you hand fly the plane to stay in formation? Answer: The plane is very reliable, and I hand flew some times, but auto pilot handled a great deal of the flight. Question: What about the air refueling events? Answer: We had 100% success even in the clouds; the big thing here is that the plane is very stable and reliable with no problems. We had no disconnections; the F-35 is a very stable airplane. 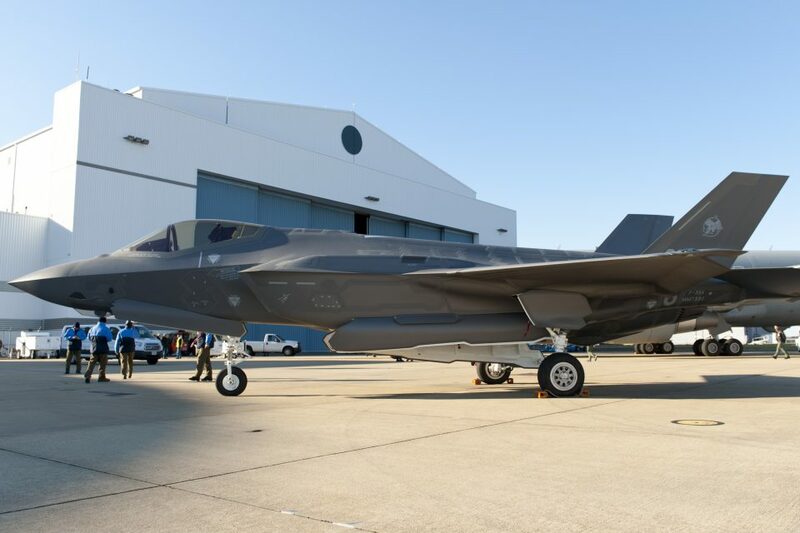 Question: This is the first F-35 built on a new assembly line. Did that come into play in your calculations in flying the aircraft? Answer: We did 15 flight hours with AL-1 prior to crossing the Atlantic and we had no issues, and I mean NO issues. 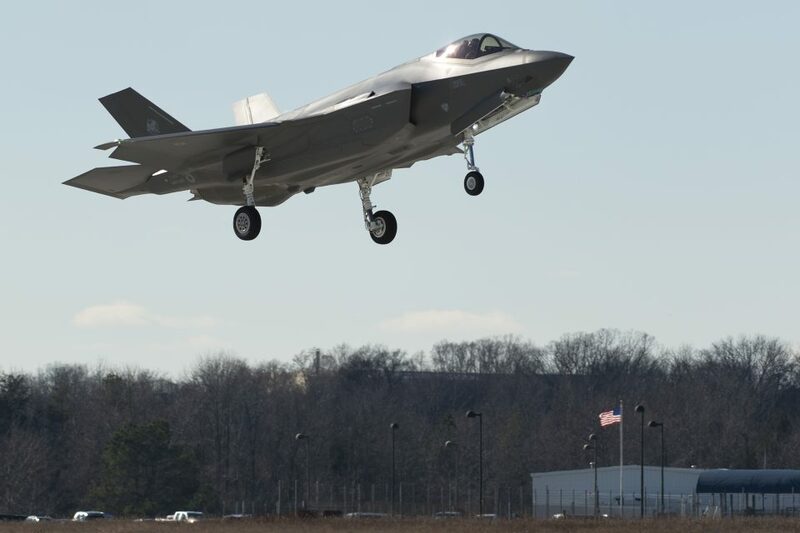 It is the first F-35 built outside the United States. Our workers at the FACO worked as a team as a team to get this result. We are building for our own air force and wings for other air forces. We flew the jet 5 times back to back to back to back prior to coming. I don’t think that has ever been done before as well. Question: How many flight hours do you have on the F-35? Answer: About 50 real flight hours. I was formerly a Tornado pilot in the reconnaissance role. And then became a test pilot. Question: After the testing here, what is next for the jet? Answer: We will take the first two aircraft to Luke AFB. Then in a few months will bring additional aircraft to Luke. This summer we will ferry number 4 and 5 to give us a full complement of five at Luke. All the student pilots at Luke fly the aircraft in the fleet whether US, Australian, Norwegian or Italian. And the training allows us to learn common TTPs from the ground up. We are building a fifth generation approach from the ground up. Question: When you sit in the F-35 cockpit and flew across the Atlantic how did the various systems assist you in the flight? Answer: The great thing about the F-35 is that the human-machine interface (HMI) is so good and so built around the pilot that you don’t have to learn how it works. You can configure the screens to configure for the mission. The aircraft is built to understand; you are building a strategy, not focusing on managing the sensors or really focused on the flying function. I was able to see the aircraft surrounding me through the clouds, such as keeping distance with my tankers, by using my helmet and the Distributed Aperture System and see the C-130s below me below the clouds. Question: Did you have any problems with your helmet? Answer: No. I used the Gen II helmet and the Gen III has improved the helmet, but my helmet worked flawlessly during the flight. I was able to fulfill the mission and I am here. 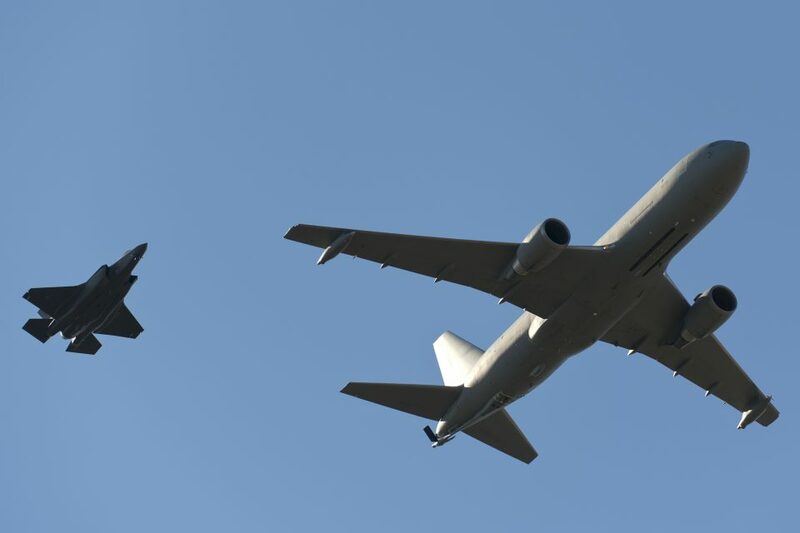 Question: How different is flying the Tornado compared to the F-35? Answer: How can answer and be polite? There is no comparison. Recently, I flew the Tornado after learning to fly the F-35. It was a real shock to go back in time. I had to move my head and focus on the switches and sensors – you have to manage the aircraft to fly. The F-35 is totally different. Question: What is it like to cross the Atlantic with DAS? Answer: It is IR so much of its functionality is used during the night not the day, although you do look through your legs and could see buildings, intersections, and various landmarks while flying. Question: Many more people saw Lindbourgh land at Le Bourget in 1927 than are here today. There are four reporters here to witness your arrival, and let make no mistake about it, this is an historic day in which an Italian flew the first F-35A with an Italian assembled aircraft, rather than the USAF having done so. How does that feel from an Italian point of view? Answer: It feels great. It is a different mindset. We are working at a different level than we have done in the past. It must be weird from your point of view to have an Italian fly the first F-35 across the Atlantic. We are making history. We are building it; we are flying it; we are maintaining it. We talk about facts. I am a pilot. We have flown all these flight hours with no problems; we are living a new reality. The aircraft is extremely reliable. We are close to 50,000 flight hours with aircraft. We had a no gripe, no maintenance discrepancies during flight as well. Question: When the Marines we barred from flying from Pax River to the Farnbourgh air show in 2014, how did this affect your preparation and thinking? Answer: I certainly realized that I was going to be first and felt that pressure. But with regard to the flight I talked with the Marines about their flight – they went from Yuma to Pax – and their flight plan to come over. Semper Fidelis is what I have to say about that. Question: How was the airplane ergonomically? Answer: I did not think about it until you asked the question. You can stretch your legs in front of you. The helmet was confortable, and the seat was very supportable and comfortable. With this helmet I do not have to turn my head, which makes it easier as well for the pilot. Question: When did you learn that you would do this flight? Answer: We started working this about six months ago and worked various scenarios for the flight including divert requirements if needed. But the aircraft holds so much fuel that there is an additional safety factor built in. After 30 minutes after take off from the Azores I could reach the coast of Canada flying high. If I needed to fly lower, I would need a refueling. We also brought our tankers to Edwards last year to do refueling of the F-35 and worked through various procedures and operating conditions. Question: This plane is designed to drop bombs and fire missiles. What you can see going forward with regard to training with regard to weapons? Answer: It is a lot easier than you think. This is one of the first aircraft that you can take off and after about two flights dropping bombs, and firing weapons. Your mission systems are so good that you can start operating weapons very early in your training and operations. We have to air-to-air pilots working with air-to-ground pilots and merging the cultures. You are not focusing on your sensors; you are focusing on the end objective of your mission. The big difference with this aircraft is situational awareness. You see everything, and I mean on the surface and on the ground and you command attack, defense and electronic warfare functions within the aircraft. The HMI is processing this and allowing you to be more strategic in your role. You have different screens and different set ups that we are using as we fly the aircraft, and over time we can help the pilots standardize ways to usual the two screens optimally. Half a screen provided a long-range view to look further; the second half showed the formation. And the second screen contained my targeting Pod in one half and DAS in the other. I hand flew because I wanted to play with the screens and figure out how to make best use of the systems during flight. 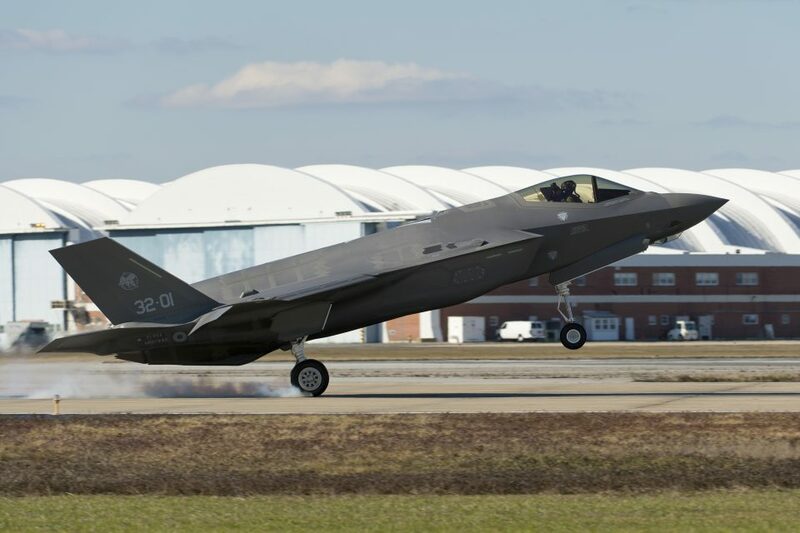 Question: How is the F-35 a game changer for the Italian Air Force? Answer: The F-35 gives us much greater global reach. We have so much gas in the aircraft and it is so fuel efficient, it gives us options in the various scenarios we are likely to face in our area of operations. 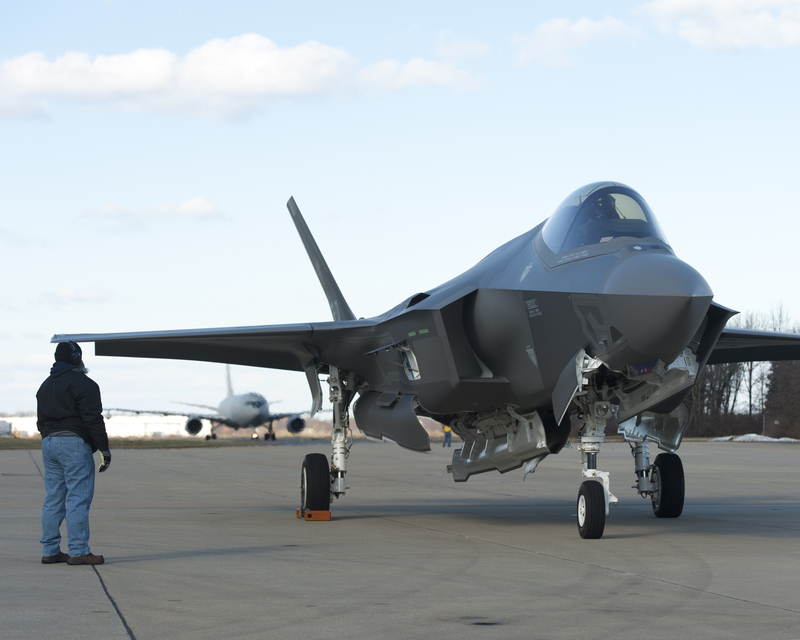 Editor’s Note: The F-35 program is rapidly maturing in the hands of the pilots and maintainers. More than 300 pilots and 2700 maintainers. And in 2013 interview, the head of the Italian Air Force discussed how the F-35 was going to be a game changer for Italy. Lt. General Preziosa laid out his perspective during a Second Line of Defense October 2013 visit to Italy. He started by underscoring the nature of global change. He saw the period through World War II to end of the first decade of the 21st century as having more in common than different. He saw this as a period, which saw significant disruption and then growth built around building up continental focused growth and development. Global regions grew and financial systems largely supported those regions in their growth and development. Airpower has been largely linear during this period, in which new planes have been added, but they have essentially replicated what we asked planes in World War II to do. Bombers and fighters have over time gotten better, but essentially they work in a linear strike and defense pattern in shaping an approach towards longer-range operations. With the information age, he sees a different type of development, globalization in which the focus is upon inter-continental growth and development. In this phase, we have to meet the challenge of new growth and development models, shape new financial systems and deal with new defense and security challenges. With the range and distance of erupting threats, and the need for global cooperation or coalitions to deal with them, airpower needs to be modified. More by chance, than by design, the F-35 is entering the global scene at this moment in global history. The plane is an information warfare aircraft, or an aircraft built to operate very differently from legacy aircraft. The difference is that the change will even be more disruptive and more radical. He underscored that a strategic shift towards pockets of defense and security challenges around the European, African, Mediterranean and Middle East regions meant that Europe, the United States and others needed to shape collaborative approaches to insert airpower when appropriate rapidly. And the F-35 as a key distributed force asset was the right match for meeting distributed challenges. He saw the approach at Cameri where it is part of a global production and sustainment system as symmetrical with the new strategic realities as well. He emphasized that the presence of Australia in Afghanistan demonstrated that a country far from a geographical area moved force into deal with a threat identified by a coalition with which it worked. And airpower has been central to Afghan operations. F-35B coverage from the allied fleet in the Mediterranean.